Lately, Microgaming has made a tremendous push on presenting several smaller game developer studios under their brand. With that, they have also pushed quite a few new games out that do not bare the standard layout of the good old, classic Microgaming slots. Nevertheless, they still carry the same principles – medium-to-high volatility and solid game mechanics. 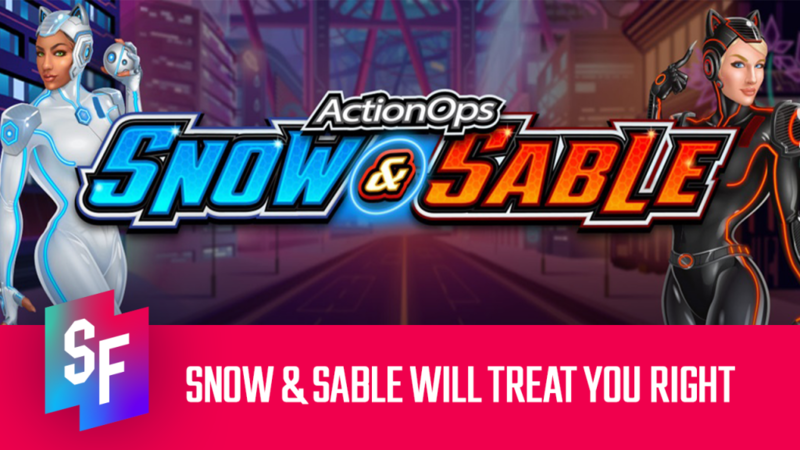 Action Ops: Snow & Sable is just one of such games. 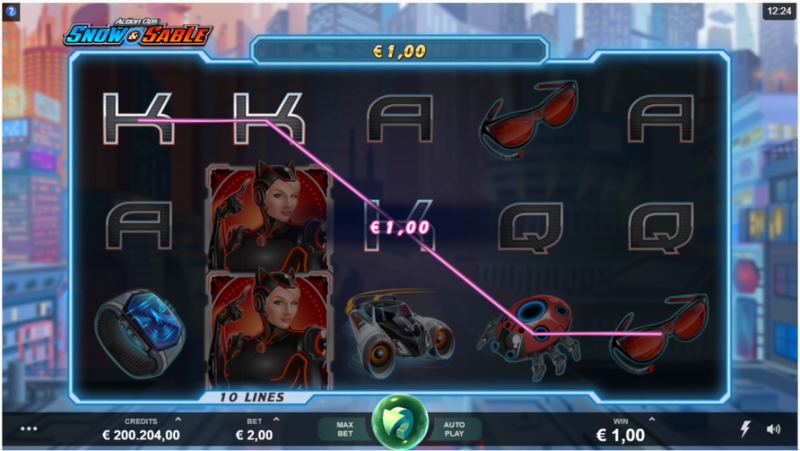 Developed by Triple Edge Studios, which Microgaming presented to the public just this year. Though, the big question is, which is relevant to some other providers – is quantity better than quality? Let’s see by looking at this Action Ops Snow Sable slot review. First thing’s first, when we open up the game, we are see the two main characters in this game. Snow & Sable act as wild symbols in this game, which we will get to a bit later. All in all, we can see that this is a very basic 5×3 slot with all the typical features. There are some wilds; a scatter symbol to trigger the wilds – nothing out of the ordinary. So, there are eight symbols total – two basic, two premium symbols and of course the wilds above & scatter symbol. 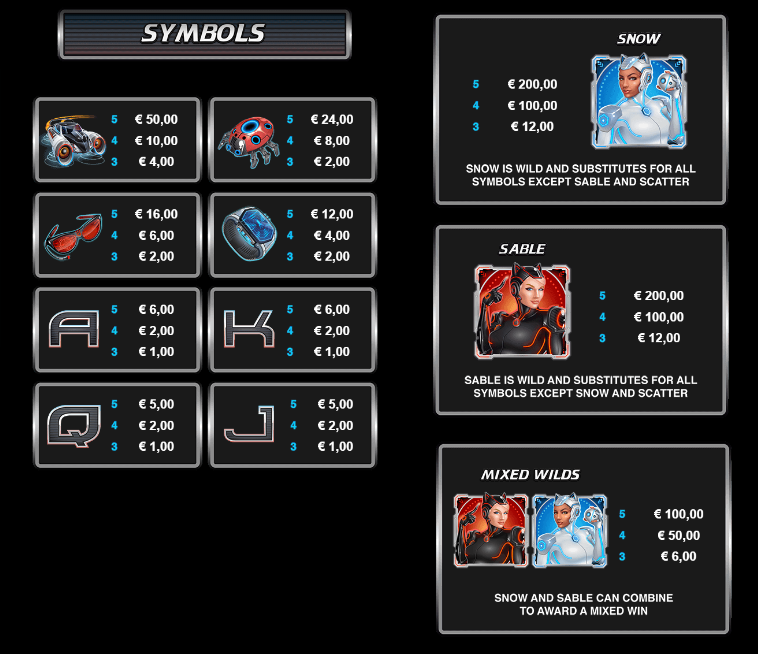 And, well, only ten paylines, which is somewhat familiar for Microgaming slots. Along with that, the game has an RTP of 96,01% and a bet range between €0.20 and €200. All in all, it seems to fall within the medium to high volatility range. The way the Snow & Sable wild symbols work is that each type of wild substitutes all symbols except the other wild. So, if both wilds fall together, a separate value for them is calculated. They still act as wilds, but the win value is reduced. To picture this more clearly, just take a peek at the symbol value table. Nevertheless, the feature seems to be somewhat fair and straightforward but nothing overly unique or innovative. It just brings the same unpredictability that most other Microgaming slots have. Generally, just expect a ton of wilds was coming down quite often and most of the time hitting trash wins. It seems to be reasonably easy to bonus on this slot. Perhaps the reason why is that the bonus is not that great. The bonus on this game also incorporates the wild symbols, slapping two wild reels on each side of the game screen. After each spin, the wild reels switch between Snow & Sable. If they reveal to be the same, basically you get high paying wild reels. Otherwise, with having each character, not only one, you get the lower-paying option. This mechanic also seems relatively fair but again, nothing exceptional. The overall layout in this game is, well, sufficient. Nothing too huge that stands out. It merely looks like a 2008 Flash game that you used to play to kill time. Except, the difference here is that you’re not killing only time but also cash. It seems that the game has been just laying in some forgotten computer folder and with the dust blown off, some freshening up – off they went with the release. It doesn’t stand up to what the competitors provide regarding design on their slots. Additionally, the soundtrack and the effects are quite average as well. It’s not that great but equally not too bad either. 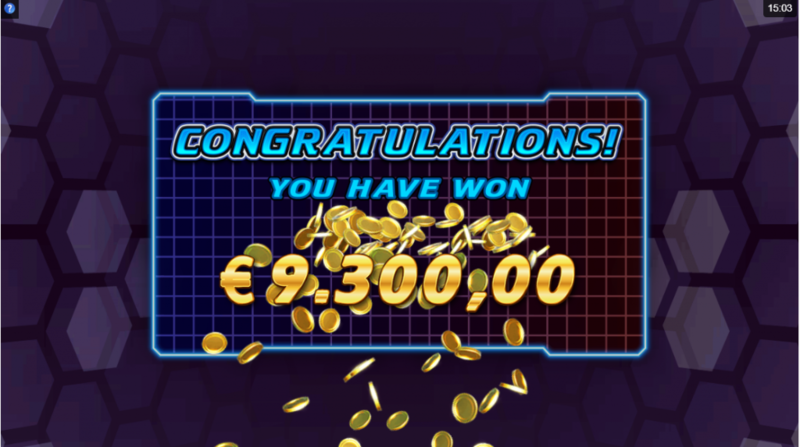 It’s bearable and certainly not off-putting as with some other online slots games. To sum up, this Action Ops Snow Sable slot review was a fairly honest look at the game. And honestly, it’s not that great. This push for quantity over quality for Microgaming recently does not seem to be the right decision. There are already quite a few stable Microgaming slots out there that are years old and still being played. This slot just does not cut it. It’s very forgettable and likely won’t last too long after its release on the 4th of December this year. Even still, check it out in any online casino that has it to have a good look at it yourself and be your judge.